Golf is a lot less dangerous compared to other sports where physical contact between players takes place. Because of this, golf players are less likely to get injuries than participants in other sports. But there is still a chance you can end up with an injury, if you don't know what to look out for, or know how to avoid getting them. The most common injuries that a golfer will sustain, is an injury to the head, elbows, knees, lower back, wrists and shoulders. Here are some tips on avoiding injuries and maybe improving your golf at the same time. You might not think you have to be fit to play golf, but if you play a round of 18 holes it will take you around four hours, you will walk for miles and you'll be carrying a set of clubs on your shoulder. A certain level of fitness is needed to do all this. Muscle endurance, flexibility and strength are all required to play golf and you need to train the body to make sure it can stand up to the strain. 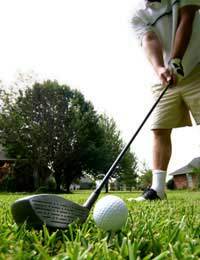 Flexible muscles are needed to play golf and can help you hit the ball further. Don't just go into a gym and start lifting weights thinking you'll get fit. You need to start a training program specifically for playing golf. Work on specific muscle groups you use most when playing golf. These are the arms, wrists, back, trunk, legs, hips and ankles. Regular walking strengthens the legs and ankles, as well as being a good way to build up your stamina. It's vital if you want to avoid injuries like pulled muscles that you warm up properly before reaching the tee. You should try and have at least a ten minute warm-up that includes stretching exercises. A good walk at a brisk pace can also help you loosen up. After the round warm down with a few light stretching exercises to avoid stiffness and soreness in the legs and back. Touch and feel are important when you play golf so don't forget to exercise your hands and fingers. Gently shake your hands and then clench and unclench your fists. Repeat 10-12 times. Shoulders can be loosened by placing your right arm over the right shoulder behind your back, then try to touch your right hand with your left hand by placing it behind your back at the waist. Hold for around 10 seconds then repeat switching arm positions. Repeat a couple of times each side. You can stretch your back by trying to touch between your feet while in a sitting position. This should be done slowly to avoid injury. Try and hold the position for 20 seconds then repeat as many times as you feel is needed. Legs can be stretched by standing in an upright position with your legs as far apart as possible without being uncomfortable. Then with both hands try and touch your right foot while keeping your legs straight. Hold this position for 15 seconds. The exercise should then be done again for the other leg. Repeat five times for each leg. As soon as you set foot on a golf course you should be aware that there are a lot of golf balls going to be flying around and you don't want to be on the receiving end of one. You also need to take care you don't strike anyone with one of your shots. There are some rules you need to obey to avoid injury. Before you start to swing a club look around to make sure the immediate area around you is clear of any others. After striking your shot be careful not to let go of the club, or throw it to the ground as it could strike someone. Stand at a safe distance behind and slightly to the side of the player striking the ball. Never stand in front or to the side of anyone striking the ball, as you could be injured by a miss hit shot, or by the ball rebounding of an object like a tree or sign. Always be aware of the position of other players on the course, when they or you are taking a shot. Don't hit the ball until there is a safe distance between groups of golfers. Never go out on the course during a lightning storm. Metal golf clubs and lightning are a bad combination. If you warm up properly and use your common sense when on the course, then your round of golf should be injury and incident free. Although I can't guarantee it will be bogey free.